Tony Hayward: All Washed Up?…….The Oligarch Kings…..
Well may he have been seen with his head in his hands at that press conference at the weekend. For oor wee Tone is simply the latest victim of the broken well in the Gulf of Mexico. We can add him to the pelicans and the ruins of America’s oil strategy. President Obama has clearly been taking the trouble to finger Tony Hayward as the villain of the piece in the ongoing on-growing mess that is the Gulf of Mexico burst. At the weekend and totally at sea, Obama publically stated that after Tony’s ill thought out and injurious remarks about “wanting his life back” and that the mess was “only tiny in comparison to all that water” he would not employ him. The question now must be – will BP? They sure don’t want to go down with all hands. There will be questions being asked in BP as to when he goes, not if. Who will shove him overboard first, the board or the shareholders? Obama wants it nice and simple, and above all as far away from the White House as he can get it. Obama needs to appear tough, resilient and above all else effective. He can’t be any of these. He can’t fix the leak, and there are no government resources that he can employ that can. No Bruce Willis to call on, no Thunderbirds and International Rescue either. Just a burst pipe at the bottom of a mile’s depth of sea. Impotency is a President’s worst nightmare. It makes you look like Jimmy Carter. You wonder why they allowed drilling there when they didn’t have cast iron assurances that the technology worked. Ah yes, regulators – so that’ll be like the banks then, they were regulated too. That and an absolute need to be energy self sufficient made them rush into deep water. So Obama talks tough for a domestic audience. He has irritated his allies by referring incorrectly to BP as British Petroleum which is as out-dated as calling it Anglo-Persian Oil. The Brits are a trifle tender on the subject of their big brother at the moment. Truth is BP is only 44% British and is 39% American. And of the American interest 14% are private individuals. If he does stop the payment of a dividend then he denies US private individuals $4 billion! A real vote winner that. This weekend at the Movies……..The 1980's all over again…. This weekend, two 1980s retreads hit theaters, aiming to tap into the themes that made the originals so popular as well as to draw the nostalgic. The Karate Kid crane-kicks its way onto at least 5,400 screens at 3,663 locations, while The A-Team marches onto approximately 5,200 screens at 3,535 locations. 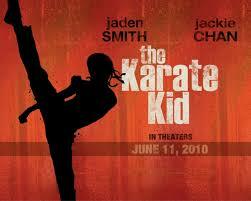 Produced by Will Smith and featuring his son, Jaden, in the title role and Jackie Chan as the martial arts mentor, The Karate Kid remake seems less faithful to its source material than The A-Team. The titular Kid is a pre-teen verus Ralph Macchio’s teenager from the 1984 smash, arguably lowering the dramatic stakes and relatability for older audiences. The Kid moves to a new location: China instead of Los Angeles, so now only the Kid is a cultural outsider, whereas, in the original, the mentor was as well. What’s more, the martial art is now kung fu instead of the titular karate. The original Karate Kid debuted nearly 26 years ago in June, grossing $5 million at 931 sites (or the equivalent of around $12 million adjusted for ticket price inflation) and ended its run at $90.8 million (or around $215 million adjusted). The Karate Kid Part II, in which the Kid goes to karate’s native land Japan (like the Kid goes to kung fu’s native land in the remake), made even more in 1986, but the franchise fell apart with The Karate Kid Part III in 1989. The 1994 revival The Next Karate Kid, featuring the original’s Pat Morita and Hilary Swank as his new student, failed, grossing $8.9 million in its entire run. Though the franchise faded, martial arts continued to be a facet of action movies, and Jackie Chan rose to prominence in America. Mr. Chan mined similar material (albeit in the fantasy genre) with The Forbidden Kingdom, which opened to $21.4 million in 2008 and closed with $52.1 million, and he’s generally been popular among the kids the new Karate Kid has targeted. Recently, Never Back Down, which was essentially a Karate Kid remake, delivered modest numbers ($24.9 million total), but it shot for teens and young adults. The new Karate Kid‘s remake is banking on its universal underdog, fish-out-of-water and culture clash elements that help made the original such a success, and distributor Sony Pictures’ has cut trailers and ads designed to rouse moviegoers with those themes. In Box Office Mojo‘s reader polling, 12.9 percent have voted to see The Karate Kid on its opening weekend. That’s a relatively strong number given the type of movie it is. The A-Team is the latest television show adaptation, and the sub-genre has had a mixed track record. The first two Mission: Impossible movies were huge as was the first Charlie’s Angels and the less-well-known S.W.A.T.. On the other hand, pictures like I Spy and The Mod Squad fizzled, while the comediesThe Dukes of Hazzard and Starsky and Hutch and the serious Miami Vice were mid-range performers. An unrelated blast from the ’80s, G.I. Joe: The Rise of Cobra, posted a $54.7 million opening last summer on its way to $150.2 million. This weekend at the Movies……..The 1980’s all over again…. Alvin Greene Update #2…..June 11…. The Democratic Senatorial Campaign Committee is punting on the Alvin Greene issue back to the State’s senior politician Rep. Clyborn…..
Who isn’t happy and making a lot of noise…. After they find out if he’ll legit and where the money for filling came from…. Or if he gets thrown under the Bus….. Thus assuring Jim DeMint no opposition…. Will Greene do ANY fundraising and campaigning? The Democratic Senatorial Campaign Committee is taking a hands-off approach to the South Carolina Senate race, even as Democrats in the state fret that an unemployed veteran with a pending criminal charge emerged as the surprise winner of their party’s primary this week. New Jersey Sen. Bob Menendez, who chairs the DSCC, said his committee isn’t focused on the race in South Carolina and declined to say whether the DSCC would join South Carolina Democrats in asking Greene to step aside. On another front….Defeated South Carolina US Senate candidate Vic Rawl is pledging to review the vote count for Greene in the state…..
Here’s Greene talking to MSNBC……. The wooing of Dino Rossi…..
Daniel was very up on getting Washington State Senator Dino Rossi, a Republican, to run against US Senator Patty Murray, who is a Democrat…..
Rossi was very iffy at first….citing family and Washington ‘bad ‘rep as reasons NOT to run….. The GOP asked to run…..
With the Senate still wrangling over a groundbreaking health care overhaul, about a dozen Republican senators — nearly one-third of the GOP conference — took time out from their hectic schedules in late March to talk to an out-of-towner about his family and their governing priorities if they were to retake the majority in November. The out-of-towner in question wasn’t some wide-eyed, camera-wielding tourist. Rather, he was a prospective star Senate recruit considered essential to GOP hopes of expanding the general election playing field and winning back the upper chamber — Dino Rossi. The goal was to persuade Rossi to challenge three-term Sen. Patty Murray (D-Wash.). And Senate Republicans were ultimately successful, with Rossi eventually announcing his bid in late May — about two months after his red-carpet treatment in the Capitol. The episode provided a window into the sometimes elaborate courtship process that takes place during candidate recruitment, with Rossi leaving D.C. feeling reassured that a Senate career is not mutually exclusive with having a family and that he would not want for national support if he entered the race. His would-be colleagues compared his potential candidacy with that of Republican darling Scott Brown’s winning Senate campaign in Massachusetts and cast the 2010 crop of GOP Senate candidates as a sort of dream team that could fundamentally alter the ideological composition of the U.S. Senate. “When I went there, I wasn’t all that convinced that if they got the majority, they’d actually do something, because I don’t need to be part of any club,” Rossi said in an interview with POLITICO. Vice President Biden made stops in Egypt and Kenya on the way to South Africa…. And because he isn’t the President right now …..
Biden’s presence at the World Cup is typical veep stuff: earlier this year heattended the opening ceremonies of the Olympic Games in Vancouver. This kind of soft diplomacy — on display at ceremonies, games, backyard barbecues — is par for the course for the second in command. But Biden’s trip to Africa, largely underreported, has also marked a return to the hard stuff for the man who was once chair of the Senate Foreign Relations Committee. Before heading to South Africa, Biden stopped in Egypt and Kenya to meet with regional heads of state. These visits were more than photo ops to demonstrate U.S. support for President Hosni Mubarak of Egypt and President Mwai Kibaki of Kenya. Instead, Biden went into the meetings with an agenda that is in many ways a holdover from his time tackling foreign affairs: to try to gather regional support to stabilize war-torn Somalia, and to re-energize dialogue between North and South Sudan to prevent a return to Africa’s longest-running war. On Sudan, in particular, Biden has long been vocal. 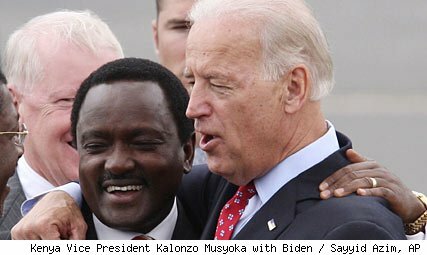 In 2007, when he was still a candidate for president, Biden called for the use of military force to secure peace in the Darfur region of the country. Then-Senator Obama was also engaged on the issue, calling for international action to end the violence in the region. Since being elected, however, Obama has come under fire for his handling of Sudan. In particular, the White House has found itself defending Special Envoy Scott Gration, who announced during a trip to the region in July 2009 that the genocide in Darfur had ended. This late Morning (US Time) the 18th FIFA Soccer World Cup started. In the opening Match Host South Africa drawed Mexico to a 1:1. In the first half Mexico was clearly better while in the second half the Host were better. South Africa was a little bit unlucky at the end by hitting the Post in the last Minute. Second Match of this Group is starting in a few Minutes: France – Uruguay. JOHANNESBURG – A new day – a new era for that matter – dawned on South Africa and the entire African continent Friday. The first World Cup in Africa kicked off amid pageantry, a celebration of its culture and a South African tie at Soccer City Stadium in Soweto. Rafael Marquez‘s goal in the 79th minute spoiled the South African party a bit as the hosts left the stadium with a 1-1 draw in the opening match of the World Cup. Midfielder Siphiwe Tshabalala‘s spectacular goal in the 55th minute lifted the hosts to a one-goal lead in front of 84,490 enthusiastic and noisy fans. Midfielder Katlego Mphela, who created the South African goal, almost became a national hero, as his left-footed shot bounded off the left post and out of bounds in the 89th minute. The opening ceremonies celebrated the culture of Africa and the host country with music and dances that evoked the culture and history of the continent. But even while South Africa was celebrating itself, the world and the beautiful game, tragedy marred the event. Former president Nelson Mandela, the driving force of the country’s end to its apartheid policies, was unable to attend the ceremonies. He was mourning the death of his great grand-daughter, Zenani Mandela, 13, who was killed in a car accident while returning home from a pre-World Cup concert on Thursday night. “The FIFA World Cup is in South Africa,” Blatter told the crowd and a worldwide TV audience that believed to be more than one billion. “Thank you. The moves at Honda to increase wages and better working conditions have gown in intensity and size to other area’s and industries in the country….. This will surely result in higher prices for Chinese made goods….. Unrest …in any form has to make the worlds economies uneasy…. And this labor wave seems to be much larger than initially reported…. Also……With the size of it economy…. And number of people in its country…. Which could have political ramifications…. In Zhangshan, in southeastern China, about 1,700 workers at a Honda Lock factory, which makes locks and keys for Honda Motors, staged an unusual march through the city streets Friday morning, according to media reports and labor activists. The workers walked off the job Wednesday, demanding more pay and the right to elect their own union representatives — a direct affront to China’s official union, the All-China Federation of Trade Unions. Two other Honda plants in Guangdong province remain idle because of work stoppages. Meanwhile, the unrest spread to China’s other main industrial base in the Yangtze River Delta, when 2,000 workers at a Taiwanese computer parts plant walked off their jobs in Shanghai’s Pudong district. In Kunshan city, in Jiangsu, just outside Shanghai, workers striking at a Taiwanese-owned rubber factory earlier this week clashed with police who tried to break up their protest. Workers this week also walked off the job at a Japanese industrial sewing machine plant in Xian and at a Taiwanese sporting goods factory in Jiujiang, in Jiangxi province. Various economists, labor experts and activists said there were many more strikes and work stoppages rolling across China, but the unrest remained largely unreported in the country’s strictly controlled state-run media. “It’s everywhere. And all kinds of enterprises,” said Xu Xiaonian, an economics and finance professor at the China Europe International Business School. “It’s not confined to multinationals and joint ventures. And not just the South — everywhere. Note…..We posted here several months ago that China was on the cusp of serious political problems due to the countries government need to keep people working and busy……and out of trouble…. The Chinese government tends to react harshly when threatened…..